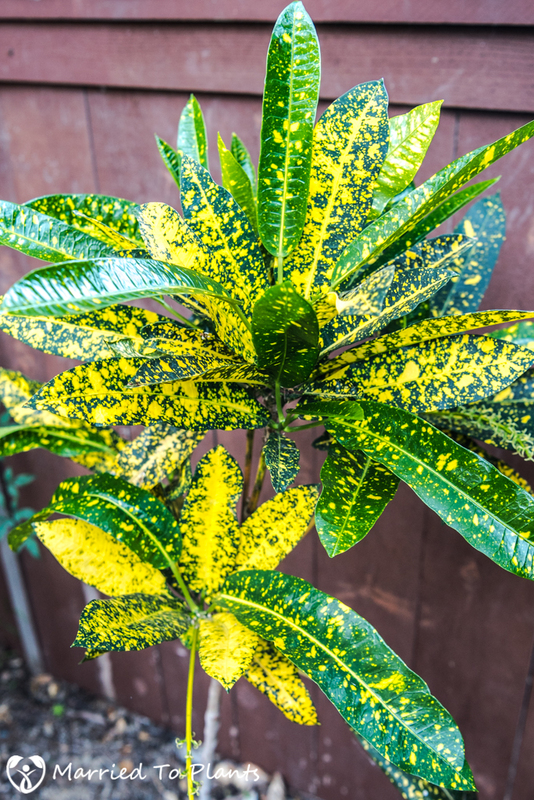 When I started my garden 12 years ago I had no idea that such a colorful and tropical plant as a croton (Codiaeum variegatum) would grow, let alone excel, in Southern California. Through the years I have been fortunate enough to test close to 25 different cultivars to the garden. Some cultivars did in fact prove difficult to grow, some hated the cool winter soils and others just grew too slowly. After weeding those out, I am left with 15 different ones succeeding in my garden right now. When people tour the landscape, one of the more common requests is asking where I got certain crotons that a visitor fell in love with. Because almost all mine came from Florida, propagating them would be of great value in order to share with others in Southern California. 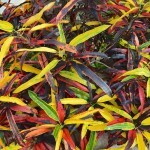 However, crotons are one of those plants—like the hibiscus—you can not propagate by seed because they won’t come true. So you must propagate by other means. I wish the plants did come true from seed, as I have quite a few self-seeding in my garden right now; like this cultivar called “Purity” shown below. 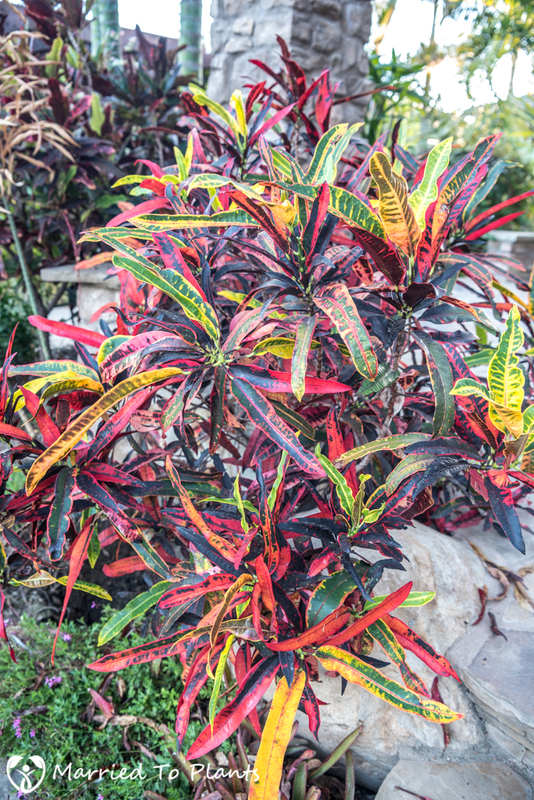 There is no shortage of crotons in my yard that I want to propagate and spread throughout the garden. Most likely my favorite is the cultivar “Stop Light.” Great color, nice up-right bush, handles the cool winter soils, and does well in sun. This plant below would be my first subject. Another yellow and green variety that I like a lot is “Eleanor Fisher.” I needed to propagate this one because I only bought a single stem originally and it doesn’t like to branch. The goal is to propagate and add a few more plantings under it to fill out the bush. “Trinidad Interrupted Leaf” is also a newer addition from the same person I received “Fishbone” from. I like the odd leaves on this cultivar. The first step is to find the right piece of wood to start your cutting from. You don’t want to take your cutting from too far down the branch, as it might not make new growth on really old wood. Also, you do not want too fat a piece, where it could dry out quickly. The best choice is to find an actively growing branch that has the thickness of a pencil, and cut it. Plan on your final cutting size to be between 5–8 inches long. 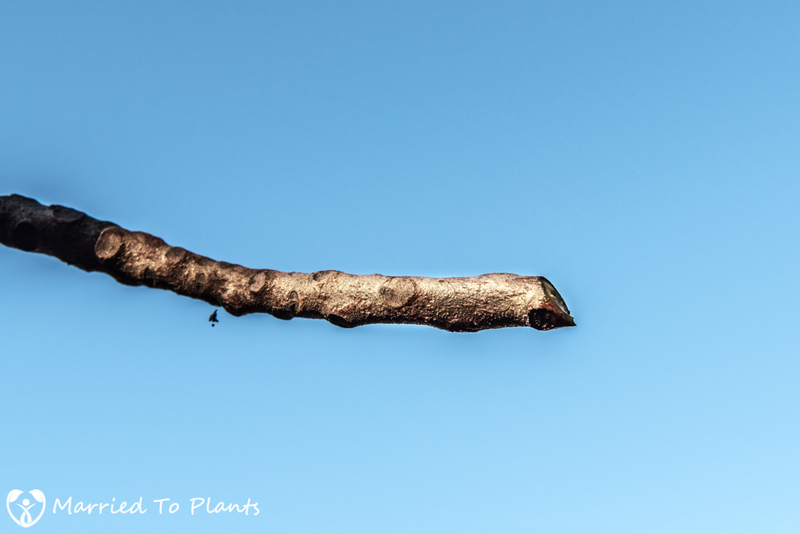 Once you cut off the branch, you will then need to cut the growing tip off. I like to cut just below the green wood were recent growth has taken place. 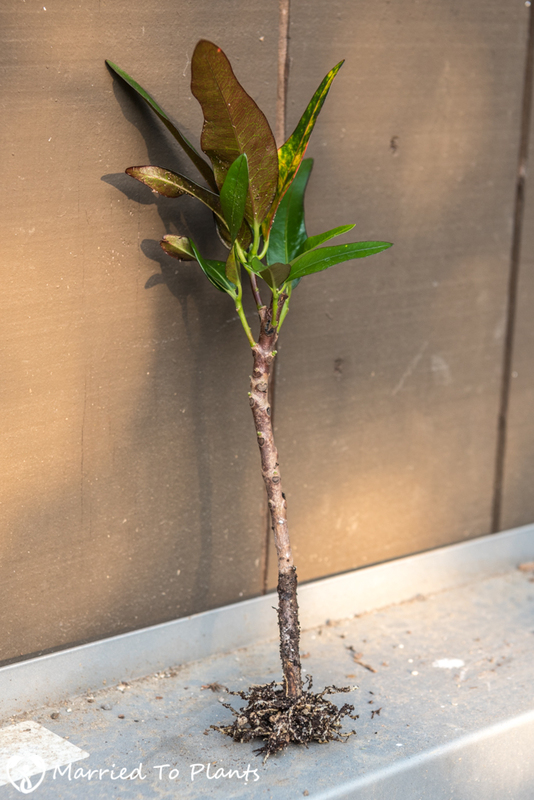 While I have chosen to cut off the tip where the new leaves are, many that propagate this way will keep a few leaves on. Once the stem cutting roots, the growth will start back up from there. 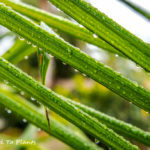 However, in Southern California, with our much lower humidity, I found that the leaf tips wilt away and die anyway. 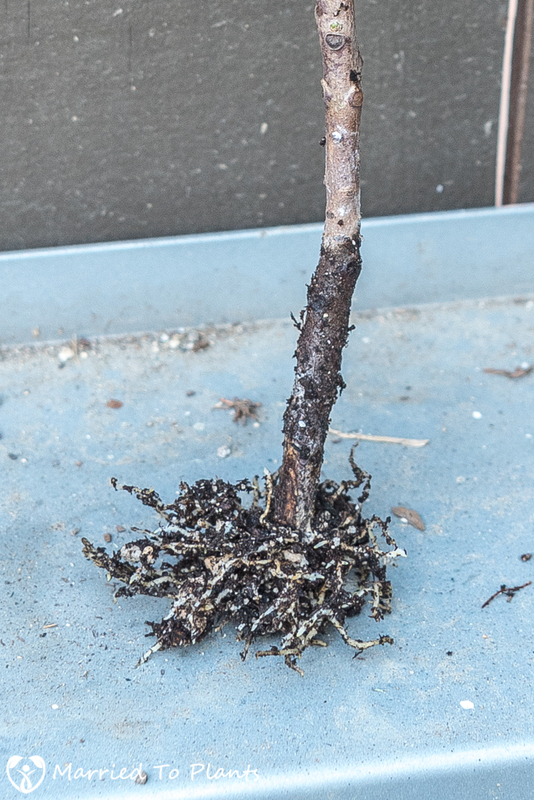 In some cases the entire stem dies off from too much water loss. 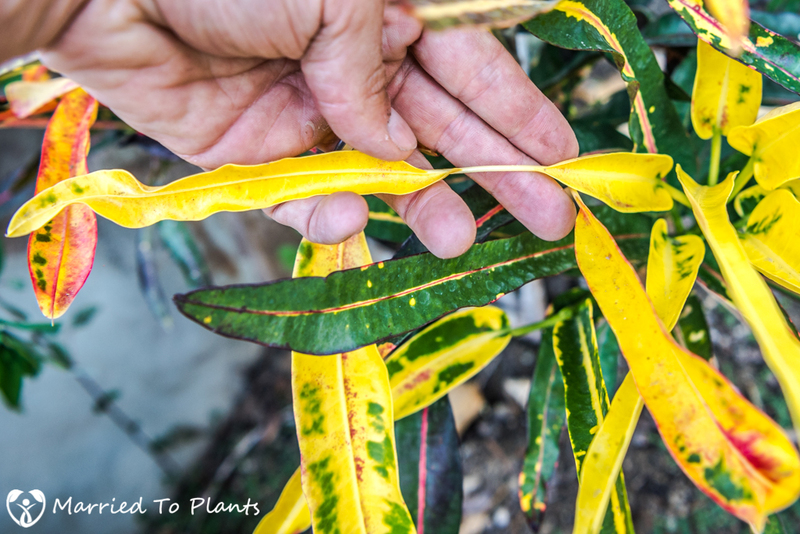 When propagating crotons from stem cuttings, be sure that the bottom of the stem cutting is cut at a 45-degree angle and just above a node. You will see later that this is where the new roots will come from. 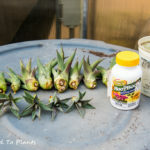 The next step is to prepare your 5- to 8-inch long cutting for the rooting hormone. I do so by wetting down the bottom half of the wood to allow the rooting hormone to stick to it. You can certainly be more precise then shown here, but I just dip the stem right into the rooting hormone and shack it around. You don’t need anywhere near the amount of rooting hormone applied like shown below, and it doesn’t need to be put this far up the stem either. I usually make 20 of these at a time, so I like to just get through this quickly. Next, I prep my mix and put it into small bands. The mix should be airy and moist. Next, poke a hole in the soil with your finger to put the stem cutting in. I will put the stem in about halfway and push the mix down to compact it around the cutting. 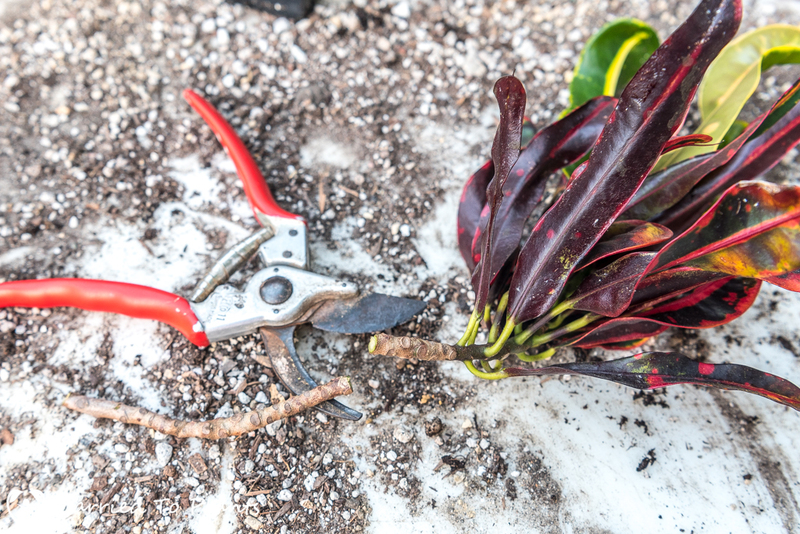 The next step in propagating crotons from stem cuttings is by far the most important for those of us here in drier climates. In order to get a stem cutting to root, you must keep the humidity very high. Water loss from the two cuts you just made is your main enemy now. This is where Ziploc bags come in. Once sealed, the bags will keep almost all the moisture locked inside, making sure your stem cuttings do not dry out. I can fit up to three of those black bands into one large Ziploc bag like shown below. While not necessary if done in the summer, I place my new cuttings in the greenhouse. 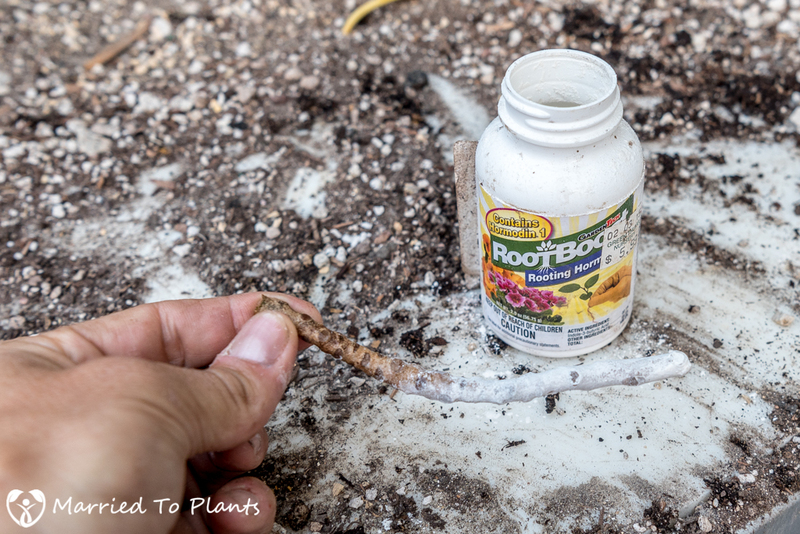 I have found the extra heat and protection from the elements speeds up the rooting process. 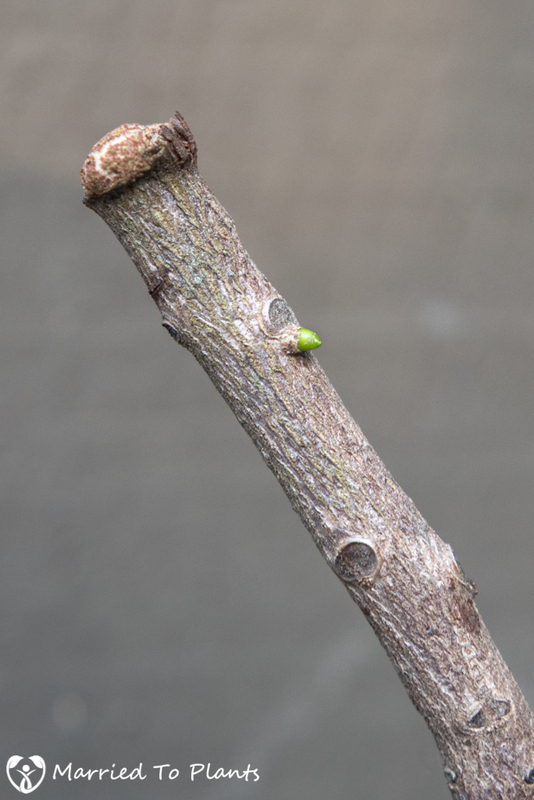 Depending on the cultivar, you will see new buds forming at around 15–30 days. New buds can appear anywhere on the stem. 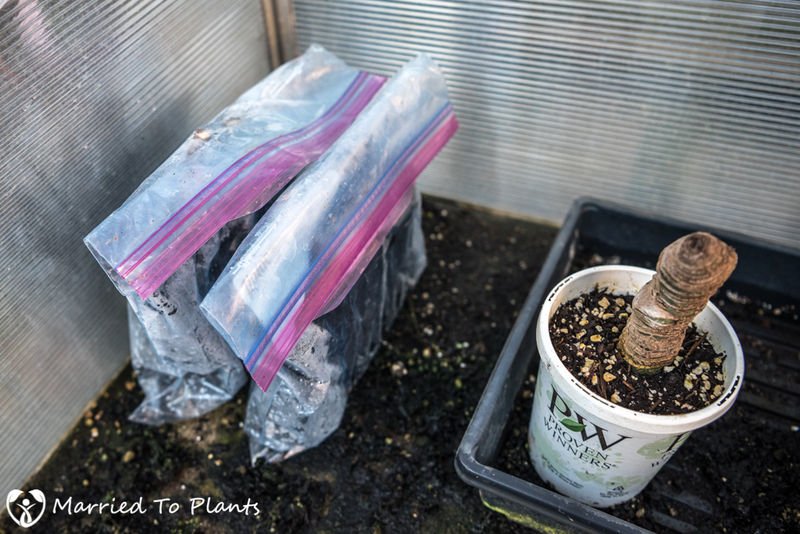 Once the buds turn into new, active growing points with leaves, I will take the bands out of the Ziploc bags. The plants will go into a bit of shock and growth will slow or even stop, but don’t worry. Within a week or so, your new stem cutting will begin actively growing again. 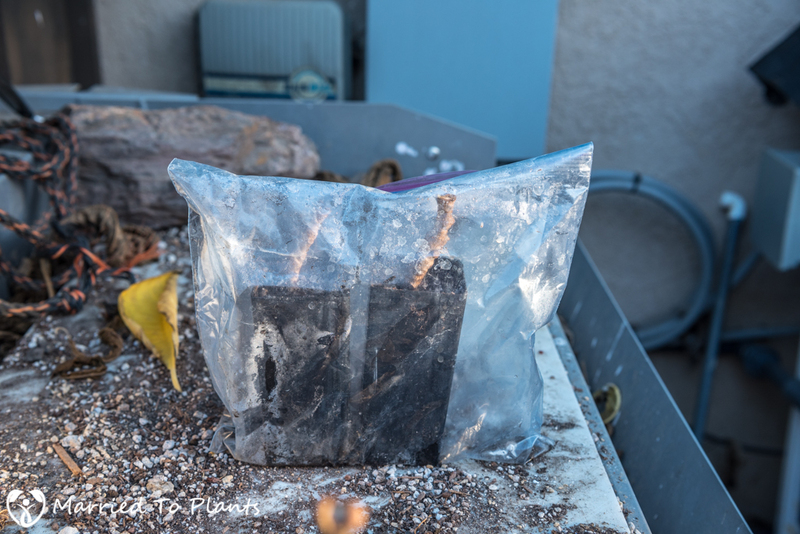 It must be noted that you have to wait until new leaves have formed before you remove the cuttings from the Ziploc bags. 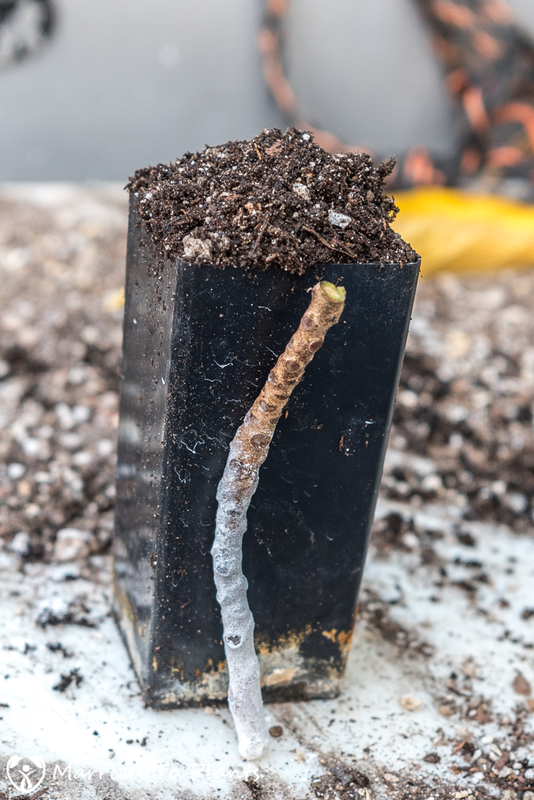 Even if your cutting hasn’t made roots, it can form new buds and even begin showing signs of life. But you must be patient and wait for new leaves. 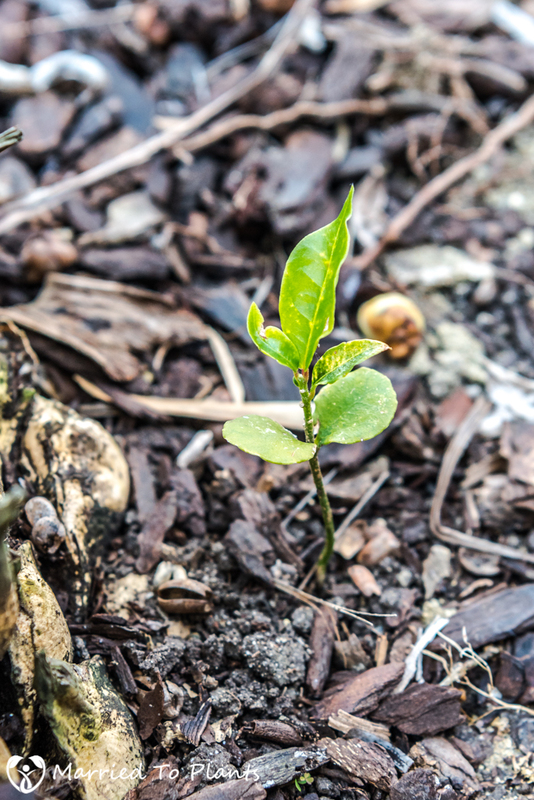 After a few months you should have a nice looking plant, with a few growing points, that is ready to be potted up. Below is a great example of one of my successful “Stop Light” cultivar cuttings. A successful stem cutting will have a bunch of nice, healthy new roots. These new plants are then put into different container sizes depending on what my final intent is. If I plan to share with other people or use them as trade bait, I will put a single plant into a one-gallon pot to grow up. If they are to be grown for my yard, I will put three new plants into a single 3-gallon pot. I like my crotons to be bushy, full plants in the landscape. So more stems are a must for me. 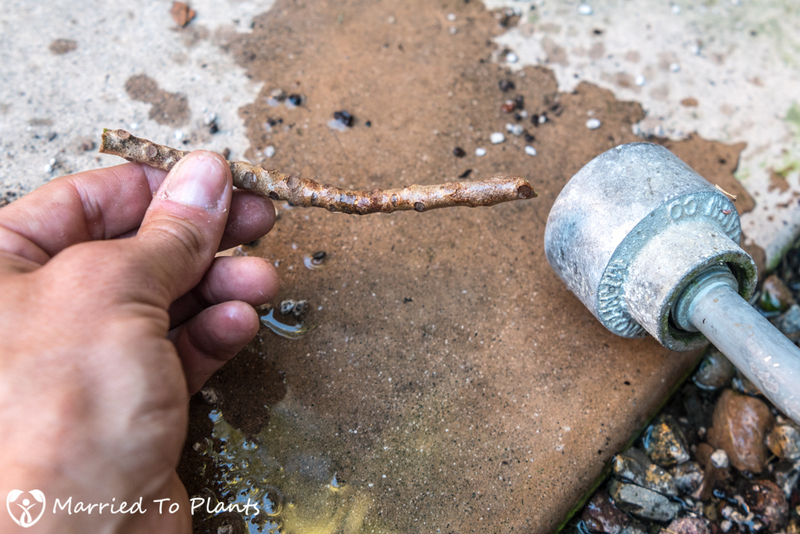 Propagating crotons from stem cuttings using the technique described in this blog post will yield great results. Below you see three pots with five total plants. For the propagation of my “Stop Light” cultivar, I started with six cuttings. Five took. In many cases I end up with a 100% success rate. Far less labor then air-layers, but similar results. 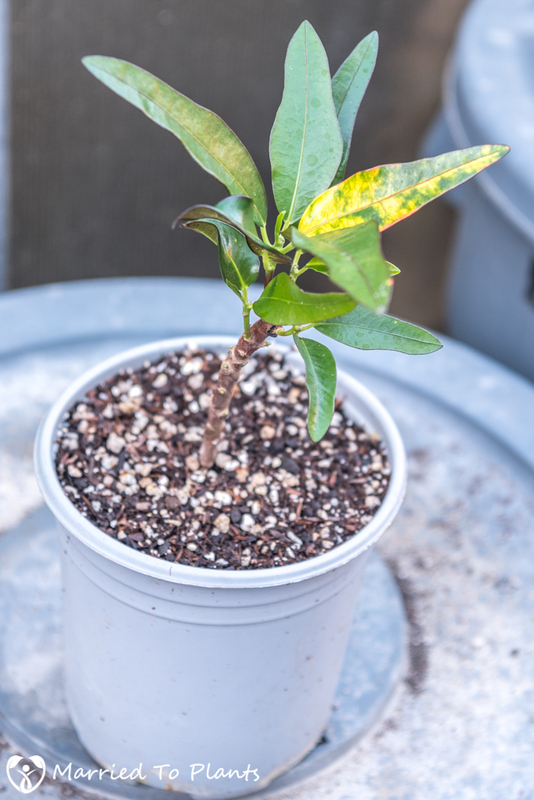 While not new to the seasoned croton grower, hopefully this post will at least help others like me that had no idea just how easy it is to propagate crotons from stem cuttings. 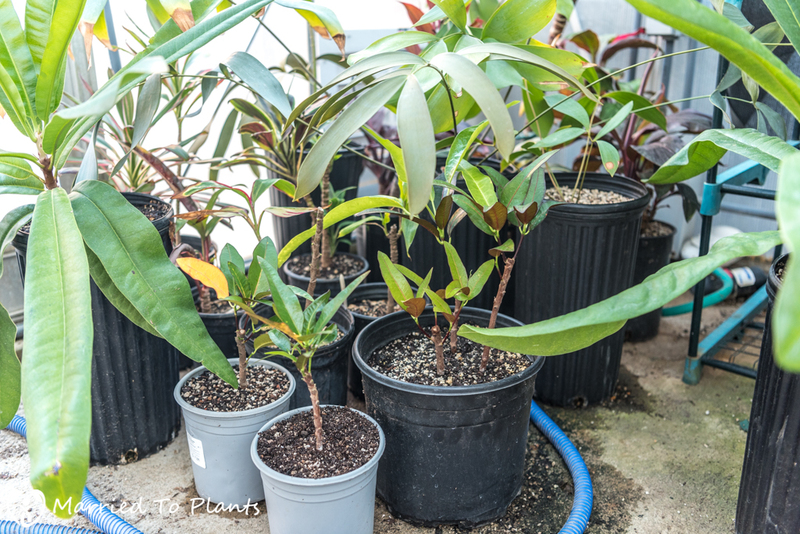 As long as you keep the humidity up, you should have just as easy of a time as when making cuttings for new Plumeria or Ti Plants. Good luck! Thanks for sharing. I’m going to be moving in 6-9 months and I want to take cuttings from some of my plants in the yard here. I presume this same technique would work for the firespike as well. For sure it would work on Firespike (Odontonema strictum). That is a really easy plant to propagate actually. I have one growing in my yard and this time of year it is at its best. I had Mammy live-all year- outdoors in the bay area for a summer,a winter,another summer- then last winters record wet killed it. I have heard that the “Fiddle leafed” Croton might be nearly as hardy as Stoplight. Another is Mrs. Iceton. I cant verify of course. Locally a flowershop has grown Petra for at least 3 years outdoors in the day…back in the shop shed at night. So, if people wanted to try that way.. I really need to get Stoplight. I get a great vibe for that. Hey- I’m trying Pandanus utilis. Whats the fun if everything is a sure thing right? I have a Stoplight for you if you ever make it down this way. Petra is really slow for me. But I also have it planted in too much shade. 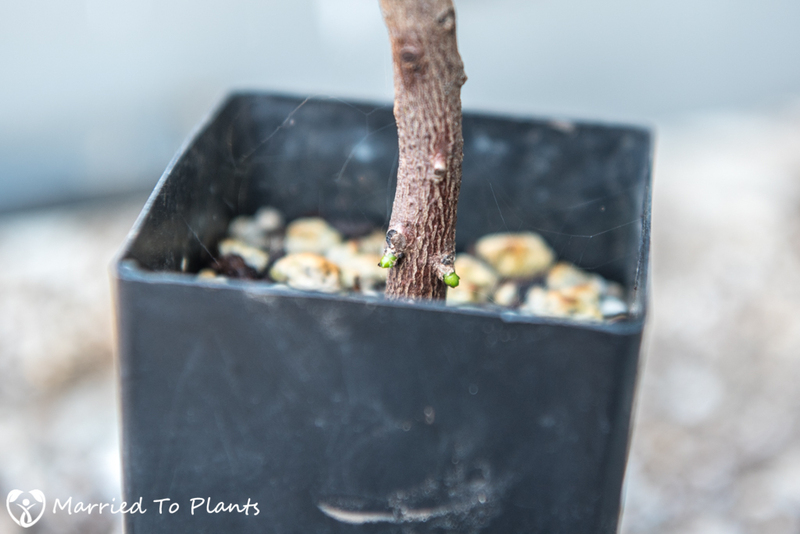 Loved this blog–although I can’t grow in garden. I’m going to try to use some of your tips with plants that grow here. I liked the way you clearly and simply passed on instructions (this is always good for me!) and included photos. Fun for me to read! Very informative post, thank you. I often think to try a Croton or two, but haven’t gotten to it yet. Just beginning to investigate Bromeliads. So many plants, so little space. Watch out! Bromeliads are super addicting. How can I replace the rooting hormone? Is it really necessary? I am really not sure if it is necessary. You would have to try. 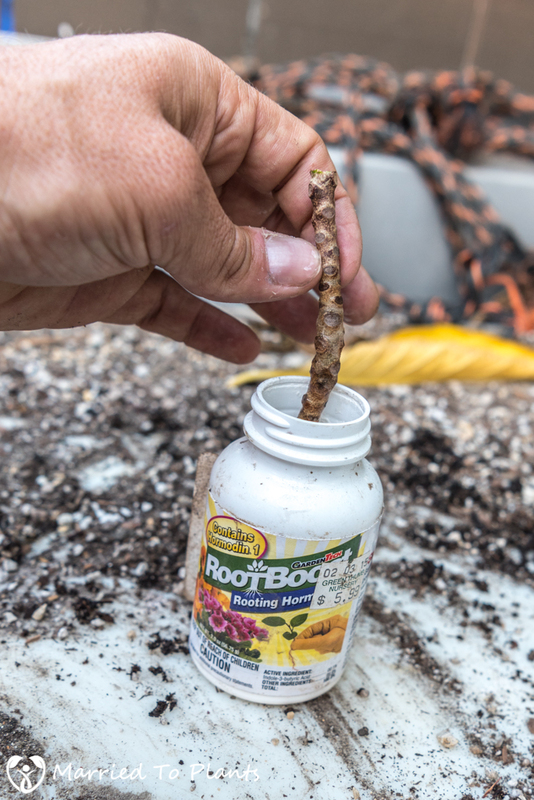 I always use the hormone to speed the rooting process and have had great success. However, I can root easier plants like Ti Plants and Plumeria without it. Excellent thread Len. Been growing crotons for the last year or so now. I have two Zanzibar plants in pots. I have read these are amongst the most cold sensitive of cultivars. They didn’t like the winter but they both survived and are doing excellent this summer. This experience leads me to believe that we may be able to grow a lot more here in SoCal than many people realize. Thanks for the photos too. Couple of varieties you showcased above are on my list now. Where did you find Zanzibar? Cool cultivar. Remember too, pots will always be better for cool soil sensitive plants like crotons. So in ground might yield different results. My Zanzibars are going to stay in pots. Don’t want to risk them in ground. I actually picked them up retail at Green Thumb in Lake Forrest. 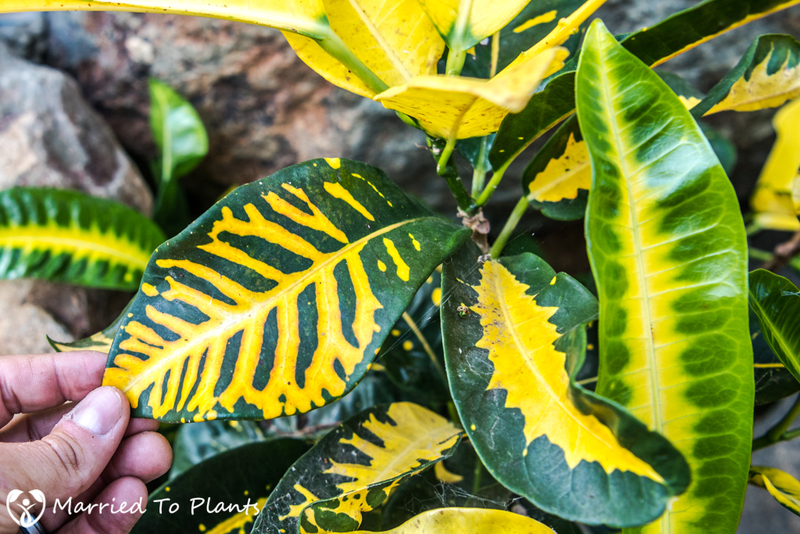 I will recive next week a few croton cuttings and This will be very informative for me. I am growing 7 different cultivars in my garden in southern Spain and i am in love with this plants. And of course, i am in love with your blog, the best for mediterranean gardeners! Thanks for the nice words Antonio. As you know, I love this plant too. Not many are more colorful in the world. Could you elaborate a little more on the watering method and routine you use once your cutting is placed inside of the Ziploc bag? 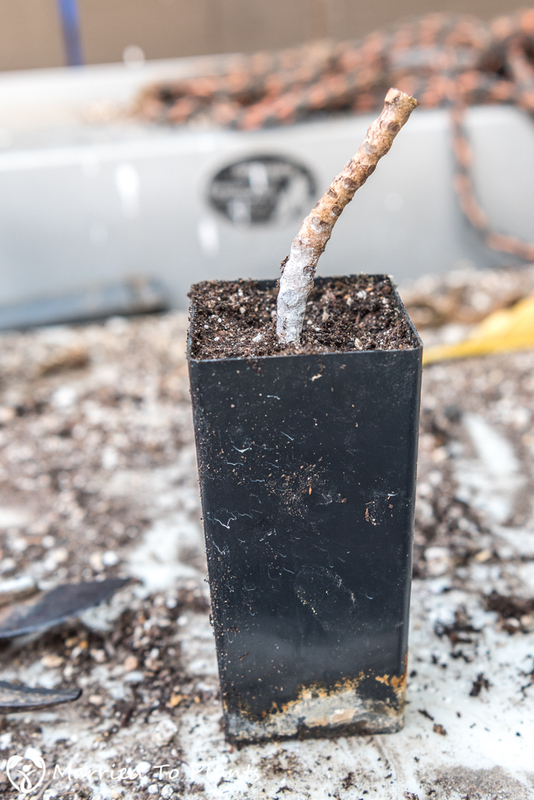 Are you misting the cutting or saturating the soil in the band until buds begin to form? and what indications are you using to decide to add moisture content to the Ziploc bag? Once I put the cutting into soil and water it in, I never water again. I leave it in the ziplock until I see leaves forming. There is no need to water as ziplock keeps all moisture sealed in. I thought that might be the case but wanted to confirm, thank you for the follow up. SO VERY INFORMATIVE. THANKS SO MUCH. BUT I WONDER IF THE STEMS DO NOT GET TOO HOT IN THE SEALED.BAGS! No, they do not get hot because they are not stored where the sun can heat them. Bands are basically just small pots for the plant. 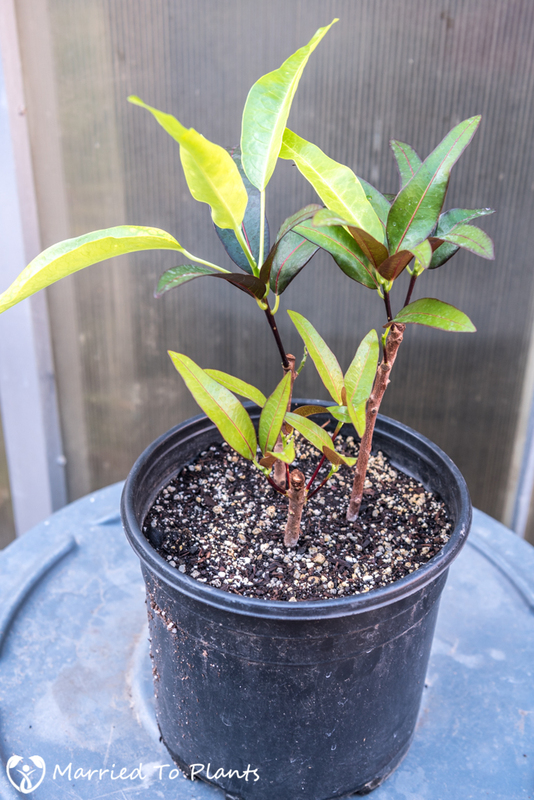 Easy to follow instructions,now i will be more confident in going ahead with my plans to propagate the two croton types that have grown really big,Thank you very much! Hi Len,I got back on the Croton horse. Added “Curly Boy” and..couldn’t resist Petra for $17 at HD. Both already little shrubs. Any updates? Hows Fishbone done? Its a spectacular plant. There are so many now who want to try Crotons in Ca or maybe AZ too. We stayed above 32f this year. I hope that’s the new trend. Hi Stan. Thanks for checking back in. I got to get busy writing again. The Fishbone did great! So did my Red Quill. Both winners. Len,I have an Aphelandra squarosa. Its my second try- the first lived 4 years and bloomed spectacularly ( daves garden bay area tropics) before it just faded away one summer. Short lived. But its hardy for me. BUT,have you tried the other Apheladra’s? You might look into them..great blooms. You could- if you don’t already have- grow Sanchezia. Another croton like plant. Anyways- good luck and look forward to your very interesting and colorful blog! Aphelandra squarosa Is a great plant but never seems to last long in my garden either. I have grown a few Aphelandra squarosa and they didn’t last long either. Few years. Croutons are long-lived plants when healthy. Thanks … an informative read! 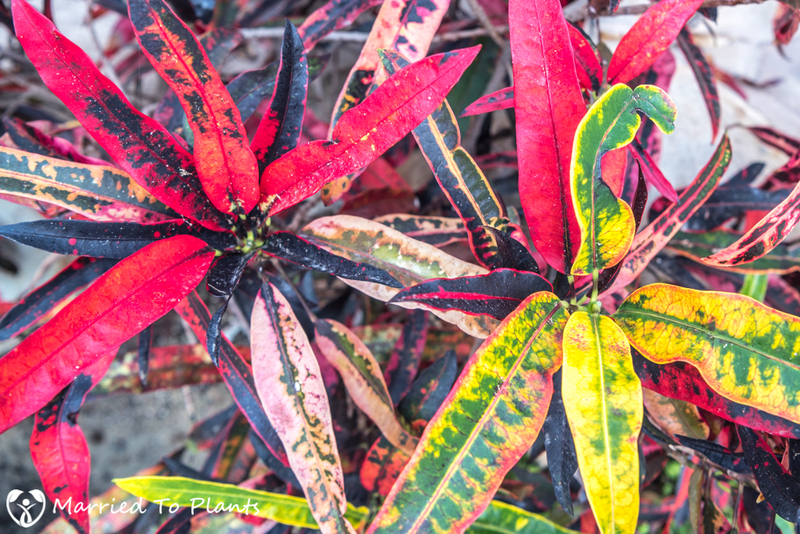 I love crotons too and have a few varieties here in Singapore but looking forward to travel to Thailand to get a few of those nice and uncommon ones. Indeed I will be more confident to propagate after reading this! Glad it helps 🙂 You live in a beautful country full of amazing plants. I did a post on Gardens by the Bay on here. Good to see you back! I’ve learned a bit since stumbling on your site earlier this year. 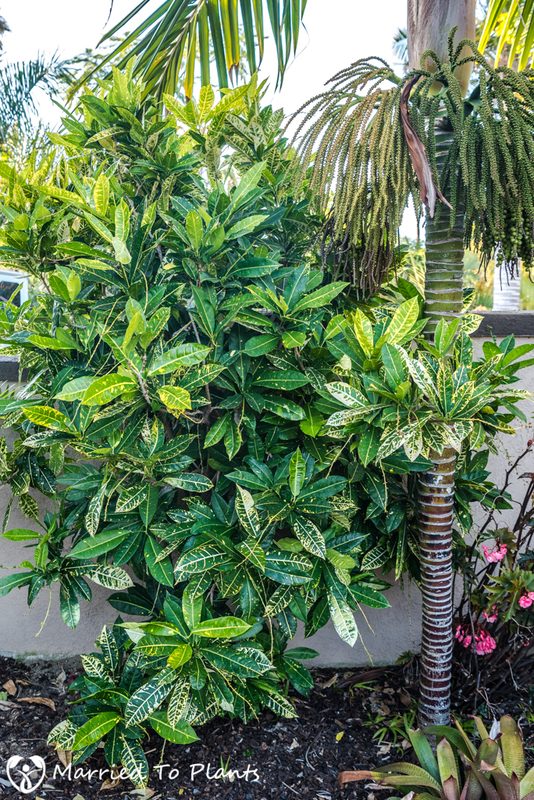 I’m looking for a source for Fishbone croton. If you have thoughts or ideas, I’d love to hear from you. Thanks! That is a hard one to find. Mine won’t be large enough to start propagating for a few more years. Have you tried https://peterscrotonnursery.com? I have. No luck. I’m thinking of going to Fla to try to track down cultivars I want. Desperate? Perhaps. But, plants! I actually have another off topic question for you, but your contact form seems to be down. Any chance it will be back up in the near future? 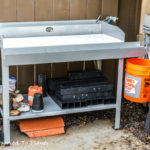 Is it wrong to really love your potting bench?